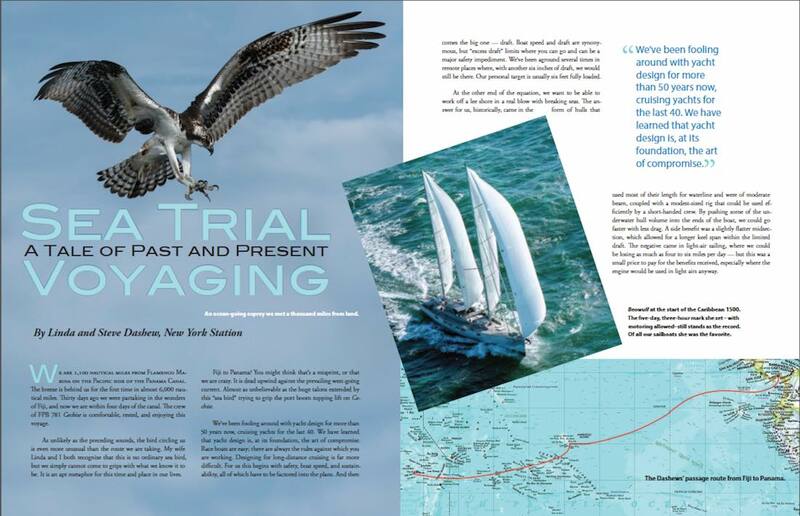 The following article by Linda and Steve Dashew appeared in Voyages, Chronicles of the Cruising Club of America, and puts the FPB 78 into a historical context. We thought you might enjoy giving it a read. “Since the Club’s inception there have been two qualifications for membership: a member must be a complete seaman, and he must be a good shipmate. The Cruising Club of America is made up of accomplished offshore sailors who are dedicated to the sport of yachting, with special emphasis on long distance ocean cruising to remote and interesting areas. The CCA sponsors the biennial Bermuda Race, and holds seminars at venues across the USA on subjects like Safety at Sea, Cruising, as well as having an informative website at www.cruisingclub.org. Read the full article in the embedded pdf below, or click here to download the pdf. This entry was posted on Monday, March 19th, 2018 at 5:34 am and is filed under Cruising Tales, Dashew Logs, FPB 78, The Logs. Both comments and pings are currently closed. Congrats, again, for being invited to such an exclusive group. It’s a proper acknowledging of you-two’s hearts and genius. So well-deserved. The article’s a beautifully-written capturing of a remarkable journey …. I’m missing my construction updates and cruising stories. I’ll need to borrow Cochise and become a contributing correspondent. It is such a pleasure to be able to follow your designs through the years and learn about how your designs have evolved through the years! One note, since we are entering a post-FPB world, it would be great to be able to read the old logs you have posted, with pictures. For example any old log that I look for, like when Beowulf’s boom broke, is sans picture. I dont know if those pictures are still available, but perhaps a header item to this page, such as “archived posts”, or “historic logs, where one could go and look at old posts for Beowulf and later Windhorse, in order, would be magnificent! Just an idea! Hi Conor, Unfortunately, when we migrated SetSail several years ago from its first hosting spot, we lost several historical images. As I have time here and there, I have used wayback time machine to try to piece certain missing images back in, but not all are available. The good new is, we have implemented a new plugin that helps you comb through historical archives either by year or category. It is under the header of “Historical Archive” and is now live.